Each month (unless I forget) I post a list of articles with advice on career enhancement including tips on preparing resumes, conducting yourself properly at interviews, getting along well with co-workers, handling a difficult boss, etc. I also post links to polls and studies done on career satisfaction, pay rates, education and experience levels, years in the field, etc. Those types of articles have been around since Johannes Gutenberg invented the movable type printing press. 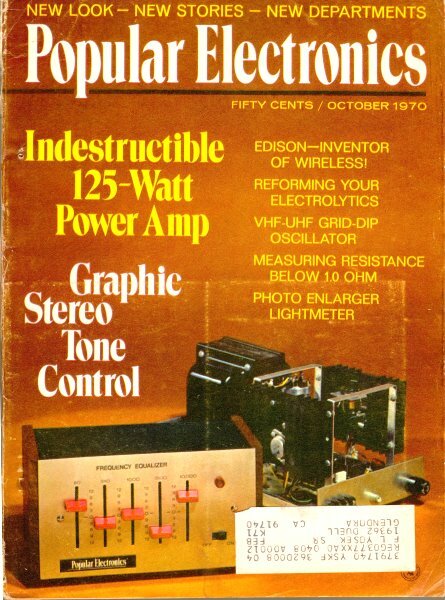 In the 1970s, Popular Electronics ran a series of articles titled "Opportunity Awareness" that offered such advice, much of which in principle is still valid today. One of the biggest advantages you can give yourself when job hunting is a willingness to relocate to a new area - even if you need to pay for the move yourself. I moved many times during my career and before getting my BSEE, paid my own moving expenses as a technician. One story after another in the periodicals tells of the shortage of electronics technicians and how employers are screaming for help, I've completed an electronics technology course, graduating with high scores, and have a commercial FCC license. But, where are the guys who wrote those articles? Where are the jobs ? They are not in my area and the only places I know that have any openings are New York and Los Angeles - the last two places I'm interested in living. Statistics from the U.S. Department of Labor show that there is an ever-increasing shortage of trained electronics technicians. Possibly, some of the articles that you have read misinterpret these statistics and ignore the hard realities that not every single electronics manufacturer in the nation is suffering from a shortage of help all the time. There are even whole areas of the United States that have shortages one or two months a year, and a surplus of technicians the remainder. Your situation is aggravated by the fact that you live in a town with a population under 4000 people and in the state of Idaho, which is not particularly well-known for its electronics industry. I feel that anyone taking a home study course in electronics, or a recent home study graduate in electronics technology should face up to the fact that there are plenty of towns that have absolutely no need for electronics technicians. It may be hindsight, but anyone enrolling in a home-study program should always make sure that the school has a good job placement program for its graduates. The school should also provide some sort of free resume writing service. There should also be school counselors to help graduates prepare resumes and to be able to direct those graduates to cities where employment opportunities exist at the moment of graduation. Without the help of a school placement service, you are on your own. Since, apparently, your school did not have a job placement service, it would be well to examine the three industries that are interested in electronics technicians. These are detailed in the Table. From this table, make a tentative decision as to the type of a job you would like. Don't be too narrow in your selection and always bear in mind that manufacturers are looking for men with experience and you may find it necessary to lower your sights in order to gain that necessary experience for a better paying job. Employers are not standing in dark doorways grabbing up every electronics technician that passes by. It is, however, true that some employers and manufacturers are "screaming for more help." The trick is to find those employers. There are about eight major areas in the country always looking for good electronics technicians-excluding New York City and Los Angeles. These areas are Boston, Denver, St. Louis, Baltimore/Washington, Chicago, and Houston/Dallas/Fort Worth. If you have the opportunity to visit any of these cities, your problem is practically solved. If not, try to obtain a complete edition of one of the major Sunday newspapers containing all of the classified employment advertisements. You will invariably find at least several dozen job openings in any of the cities mentioned above. If you can't find the Sunday newspaper, try your local library and see if they by any chance have a few of the major city telephone directories-particularly the so-called "Yellow Pages." Select some promising looking companies and send a resume to those companies. Don't hesitate to saturate a particular area. If you don't like the idea of moving into one of the above areas, there are still several tricks left. Find a smaller town that is the site of a major state university. Not all of the large state universities are in major cities. The University of Illinois, for example, has a lot of government-sponsored research work and is in the town of Champaign - with only a population of about 50,000. Such colleges nearly always have openings for electronics technicians interested in working in various scientific projects. For a complete listing of colleges and universities, consult the "World Almanac." And, for a listing of land grant colleges, write to the National Association of State Universities and Land Grant Colleges. Ask for their free "Fact Book." The address is: 1785 Massachusetts Ave., NW, Washington, DC 20036. The last suggestion I can make is to attempt to find work through a competent and reputable employment agency. There is only one nationwide employment agency that will handle clients not living in the major cities. This agency has about 400 offices and I would suggest that you write directly to the attention of: Mr. Howard Benner, International Headquarters, Snelling & Snelling, 2 Industrial Boulevard, Paoli, Pennsylvania 19301. I have been told that the Australian Government pays the traveling costs for immigrants from the United States. Is this true? If so, what are the chances of my getting a job there in electronics? I have worked as an electronics technician for three years, and I have a diploma from a reputable home study school. According to Mr. K. E. Scott of the Australian Embassy in New York City, the Australian Government welcomes immigrant settlers from the United States and Europe. The Government pays about $375 (U.S. dollars) towards the fare for adults, and approximately $400 for every child under 19 years of age. This so-called "passage subsidy" is paid after you arrive in Australia. To learn something about up-to-the-minute employment opportunities for electronics technicians, we consulted Mr. P. H. Cook, Secretary of the Australian Department of Labour and National Services in Melbourne. "The unemployment rate is only a little more than one per cent of the total workforce in Australia," Secretary Cook says. "In the professional, semi-professional, and skilled electrical fields (which includes electronics) the number of unfilled vacancies exceeds the number of job seekers." Speaking of the places where electronics technicians and engineers work, the Secretary says, "In the more heavily populated eastern States of Australia there is a strong demand for experienced electronics engineers and technical personnel. In these States, the large firms, located mainly in Melbourne and Sydney, are engaged in the production of a variety of telecommunications equipment, instrumentation and control systems, electronic componentry and radio and television receivers." The chances of an American immigrant getting a job with the Australian Government Departments are slim, "... because of the requirements that applicants for such employment be British subjects." 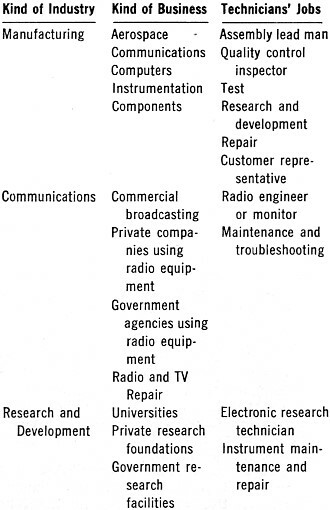 "Employment opportunities in the other States of Australia occur less frequently, with occasional vacancies arising for specialists in communications or control systems work, and there are good prospects for instrumentation engineers in those States in which major processing plants are located. The commercial TV field is well-established and growing. Color TV is still a novelty, but the predicted popularity of color TV will open new positions for hundreds of skilled technicians and engineers. 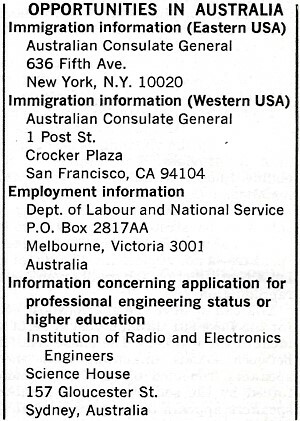 Concerning other branches of modern electronics, the Secretary states, "There is also a demand for highly skilled men to install and maintain computer hardware, although Australian manufacture in this field is at present concerned mainly with software. The development of fully electronic telephone exchanges and the extension of Subscriber Trunk Dialing services throughout Australia have meant great expansion in the field of integrated circuitry. In addition, the Australian Government actively encourages the local manufacture of micro-electronic devices to meet both defense requirements, and the needs of the Post Office and Civil Aviation." Electronics and electrical engineers from the U.S. can apply for professional engineering status, and any technician or engineer can further his education in the excellent Australian schools. According to Secretary Cook, "Professional recognition as an engineer in Australia depends upon acceptability to the Institution of Engineers, Australia. Some employers stipulate that applicants for positions in the engineering field must have qualifications for graduate membership in the Institution." Salaries for electronics technicians and engineers are from 3500 to 8000 U.S. dollars a year. Although these figures are low by American standards, the cost of living in Australia is somewhat lower, too.